There's been a lot of hype built around the new Skoda Octavia RS and now that it's finally been launched, we got a very, very short spin in the car. There are significant changes over the standard Octavia, right from a new engine and gearbox to a revised suspension setup. While we would have loved to give you a more detailed first drive review but our time with the car was far too brief and the track was super slippery thanks to the rain. But don't worry we'll have a full road test up real soon. As is typical of most European sleeper saloons, it takes a keen eye to recognise one over the standard car. The new Skoda Octavia RS gets sportier bumpers with new LED foglamps, new sportier 17-inch wheels, a lip spoiler and steel-tip exhausts. The car also sits 15mm lower, giving it a sportier, more aggressive stance. It's the same case inside the car. All the seats are wrapped in black Alcantara leather with vRS badging and red contrast stitching and at the front you get sport seats. Also new is the instrument cluster which features a lap timer. Overall, it's a neat upgrade over the standard Octavia with subtle but good looking changes. The Skoda Octavia RS features a 2.0-litre turbo-petrol engine which produces 230PS from 5,500-6,200rpm and 350Nm from 1,500-4,500rpm. The same engine is available in a 245PS state of tune in some international markets. 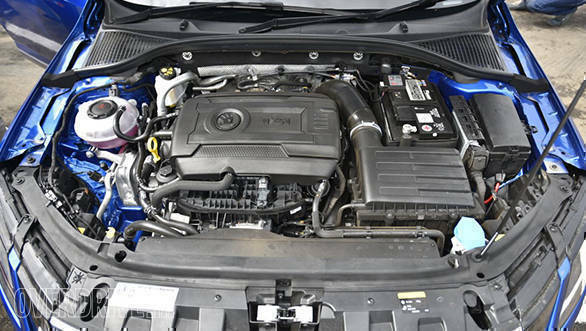 The engine, like most turbo-petrols from the VW Group is very rev happy and very linear. Throttle response is super quick too and, and the car leaps from standstill with a sense of urgency. It's not scary though, just exciting. The 6-speed DSG goes hand-in-hand with the engine, offering smooth, lightning quick upshifts and downshifts. And every time you upshift, there's a nice braap from the exhaust. Speaking of the exhaust, there is a nice, not-too-loud raspy note you hear in Sport mode. But what I really liked about the gearbox is that it does allow you to downshift pretty aggressively. That said, a 6-speed manual which is available in other markets, would have made this the ultimate driver's car. 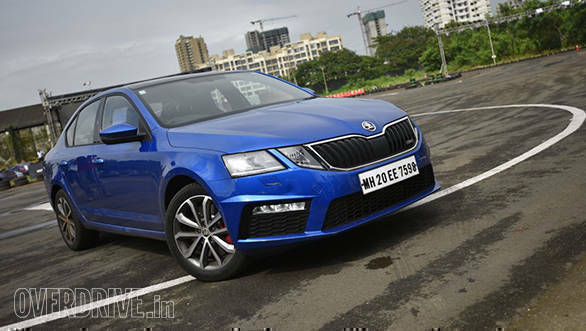 Skoda claims that the Octavia RS will go from 0-100kmph in an impressive 6.8 seconds, while the top speed is limited to 250kmph. 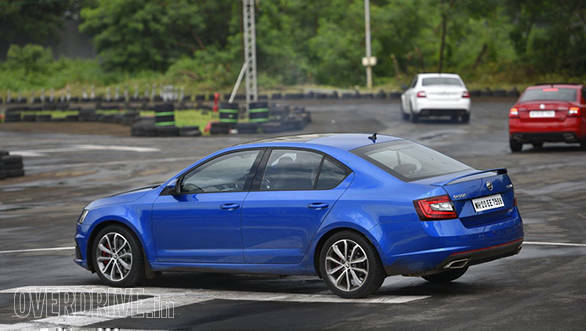 Compared to the standard Octavia, the Octavia RS has a fully revised chassis setup. While the components are the same, the way they have been tuned is different. Ride height has been dropped by 15mm to reduce body roll and the damping has gotten firmer too. But not as firm as the international spec car. According to Skoda's product team, the suspension has been reworked keeping Indian road conditions in mind, but I didn't really get the chance to test that. The Skoda Octavia RS also features an XDS+ limited-slip differential system. While cornering, the system applies the brake just a little bit to the wheel on the inside of the corner, and as a result more power is sent to the wheel on the outside. However, the system does this only when it detects a G-force of 0.15G or more. This is supposed to make the car super sharp and agile. Unfortunately, with the track extremely wet by the time I got behind the wheel, I didn't really get the chance to push the car too much. The brakes on the car have bigger diameter discs than the standard Octavia, but again, with the track that slippery, ABS was kicking in almost every time I hit the brakes, and I didn't really get too much feel from it. What I did get was some feel from the steering. Weighting seemed well judged and the variable ratio steering is very responsive, making turn-in pretty quick.